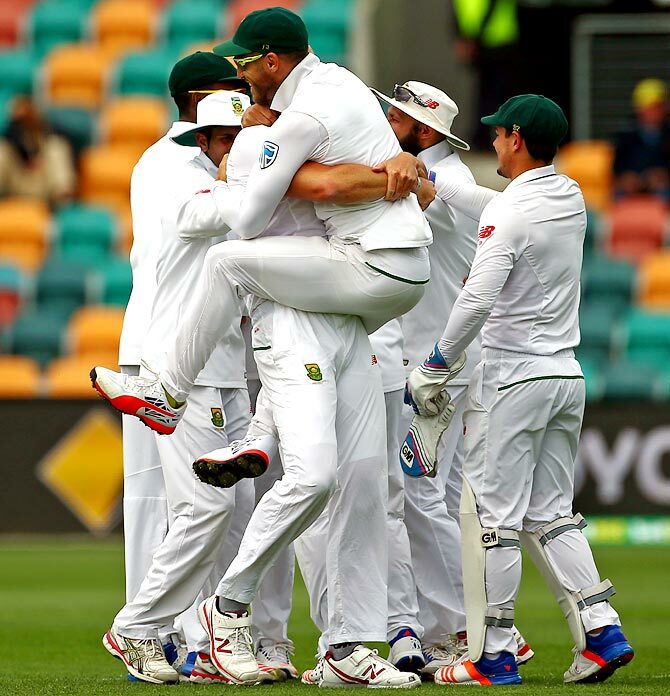 South Africa have now won their last three series in Australia, following victories under Graeme Smith in 2008 and 2012. South Africa captain Faf du Plessis lauded his "relentless" bowlers for their match-winning performance against Australia in Hobart on Tuesday and dedicated the series win to absent Proteas Dale Steyn and AB De Villiers. 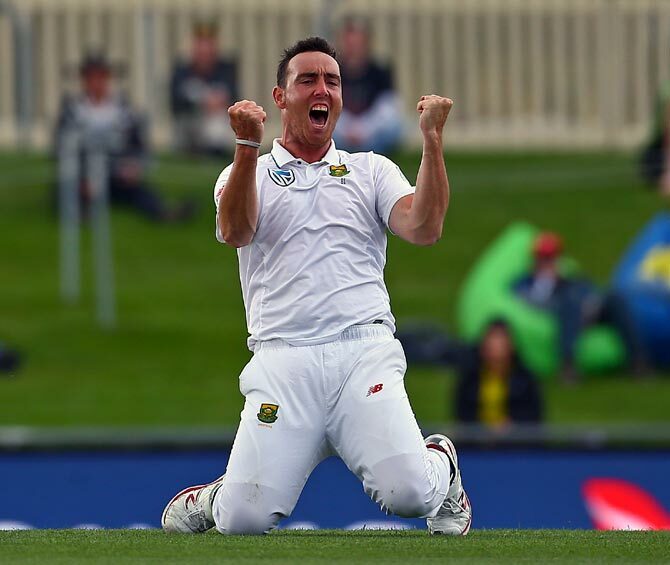 Kyle Abbott, who replaced pace spearhead Steyn, was Man of the Match after taking 6-77 in the second innings to complete a nine-wicket haul as the home side crumbled to an innings and 80 run defeat before lunch on day four at Bellerive Oval. Kagiso Rabada took 4-34 in Australia's second innings while Vernon Philander laid the platform for victory with five wickets in the first when Australia were bundled out for 85. "When you play three seamers in attack they all have to stand up at different times," Du Plessis, standing in for regular captain De Villiers, said at the trophy presentation after South Africa took a 2-0 lead in the three-Test series. "I thought yesterday we were exceptional, we didn't get the rewards we wanted but to come back this morning, just make sure we were relentless in our areas... we knew if we could do those things the wickets will come and they did. "We're just relentless, we don't let the pressure go as a bowling unit, we're there all the time and in the field we back it up." Although grey skies hung over Hobart, it was a golden morning for 29-year-old Abbott, who has had the misfortune of bowling in the era of Steyn and Philander, managing only seven further Tests since his 2013 debut at home to Pakistan. He knocked over four of Australia's top six batsmen in the second innings and broke a stubborn partnership between Usman Khawaja and Australia captain Steven Smith with a masterclass of swing, pace and bounce. "It's been a case of that, over the last few years, waiting for an opportunity. It's nice to get one and make the most of it," Abbott said. "That's always a challenge when you don't play so much, to stay match fit and keep that form in games but when I get that opportunity, I try my heart out and make the most of it." Du Plessis, who scored an unbeaten century on debut to save South Africa in the Adelaide Test four years ago, said Tuesday's triumph also belongs to Steyn and De Villiers. "Enjoy it, celebrate it with us," he said in a greeting to the players. "They're experienced guys. They know coming to Australia is one of the hardest places to come and win. "So to come here and do it 2-0 is special for us as a team but we share that specialness with great players in our side like Dale and AB, who have been here lots of times and worked really hard to try to win games of cricket."